Sometime after the release and touring campaign for “Vengeance Ascending” a schism occurred within the ranks of Diabolic. On one hand there was co-founder/lead guitarist Brian Malone, and the other the remaining three members (Coates, Ouellette, Mortellaro). Both camps carried on with each their own version of the band. Malone recruited Ed Webb (vocals, bass guitar), Eric Hersemann (lead guitar) and French drummer Gaël Barthélemy. The other three members formed Unholy Ghost together with Pessimist lead guitarist Kelly McLaunchlin. 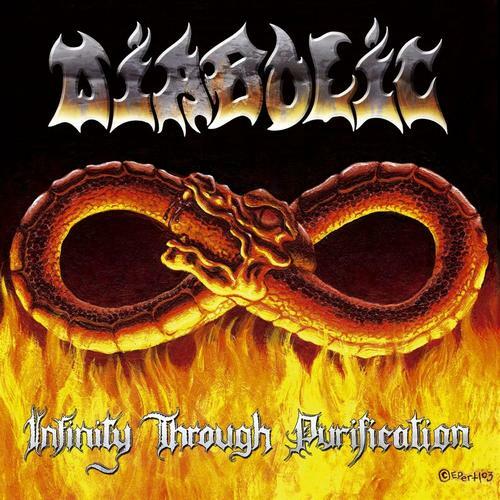 Of the two units the Malone-led Diabolic released its new album “Infinity Through Purification” in 2003, while the Unholy Ghost record arrived merely a year later. Which is the best? Least Worst Option looks at both. Making his debut is lead guitarist Eric Hersemann, and his influence is felt deeply through out the album. The winding song structures go through conflicting guitar lines, Malone’s patented slashing riffing and all tracks are full of dissonant rhythm sections and eerie circular melodies that add depth to the lead/solo trade-offs. Hersemann’s style is all over the writing and combined with Brian Malone’s more straightforward style it is the most ambitious, conceptual and musical, Diabolic record to date. Interesting is that Eric Hersemann would later leave this band to form his own band Gigan, which focused more on dissonance, weird rhythms and his signature melodies. The echoing spoken word part in ‘Internal Mental Cannibalism’ is something the band hadn’t attempted prior. Barthélemy’s drumming is also more fill oriented, and while blasts and cymbal crashes are the bread-and-butter of Diabolic here they are wrapped in a sort of musicality and technical flourish that the band would never be able to recapture. Webb’s vocal style is a lot more emotive and dynamic than Ouellette’s, although both are equal in terms of how average and substandard they sound. Webb is no Jon Vesano for one. One of the things you’ll notice is that the tempo isn’t as breakneck as it once was. The band still plays ridiculously fast, but these fast parts are now the counterpart to the midpaced – and technical sections. The greater attention to flow and dynamics also makes the tracks of this album more listenable, whereas in the past most Diabolic songs would just mesh together with only the solos to individualize then. More integral to the songs than ever before are the leads/solos. Where in the past the band would just blast without a sense of direction or purpose, here the writing accommodates the solo’ing and the other way around. Everything has its purpose, and everything is there for a reason. Increased in importance also are the bass guitar lines, and while Malone is not revitalizing his band on that end, at least these popping and throbbing lines can be clearly heard now, which is a first for this band. For the most part the bass guitar doubles the guitars, but the interplay between the lively bass lines and the spirited drum performance from Gaël Barthélemy makes this the most interesting Diabolic release as far as the rhythm section is concerned. Everything is just more ambitious and intelligent. The fourth Diabolic record is notable for just how much it breaks with tradition on all fronts. This album was recorded at Sonic Ranch Studios in El Paso, Texas (not at Diet Worms in Florida), it has artwork by Eric Pertl (not Joe Petagno) and while Malone’s riffing style is largely similar to the past “Infinity Through Purification” is the most technical, diverse and ambitious record the band had written – ever. Although vocalist Ed Webb is credited as bass guitarist, it was Brian Malone who laid the down the instrument while in the studio. The drumming style of Barthélemy is also radically different from the one of Coates. In fact, Barthélemy is far more elaborate, refined and technically accomplished than Coates ever was. It is truly unfortunate that this was Gaël Barthélemy’s only studio recording with this otherwise forgettable Tampa, Florida unit. The reaction to the album was lukewarm and mixed, which eventually led to the project being abandoned by founding member Malone. It would have been interesting to hear what this line-up could have crafted if they stayed together longer. “Infinity Through Purification” is entirely different from the three albums that came before it. It is not surprising to note that this record split the fanbase and remains divisive to this day. Malone’s Diabolic eventually fell apart with Barthélemy returning to his home turf in France, Hersemann went on to join Hate Eternal and would front his own band Gigan a couple of years down the line. 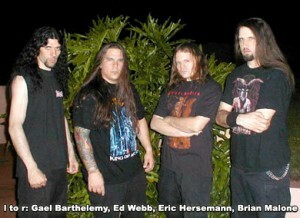 Ed Webb has in more recent years joined reformed Tampa death metal combo Massacre. Diabolic, again with Aantar Lee Coates behind the drumkit, reformed in 2006, and released a new album “Excisions Of Exorcisms” through Deathgasm Records to little fanfare, or critical acclaim in 2010. Due to ongoing personel problems the band is once again experiencing another bout of inactivity. It remains to be seen whether Diabolic manage to push out another record once the line-up solidifies again. It wouldn’t be surprising if they eventually decide to call it a day. This shouldn’t be considered a loss since Diabolic never was really good.